Home / Men's Hair / When Do Men Really Start Losing Hair? Most teenagers and young men see their fathers and grandfathers with balding heads and wonder, “Will I lose my hair? If so, when?” If you’re wondering when men really start losing their hair, there is, unfortunately, no single answer. Hair loss and the age at which it occurs depends on several factors including health, genetics, environment and personal hygiene. Did you know that smoking and stress are actually huge contributors to male hair loss? Smoking dehydrates skin and prevents blood circulation, which are key components in hair growth and maintenance. Stress, on the other hand, increases cortisol levels in the body which can hinder other hormones that are critical in hair creation. Other medical conditions like alopecia, thyroid disease, some cancers, lupus and other chronic illness can also cause hair loss. 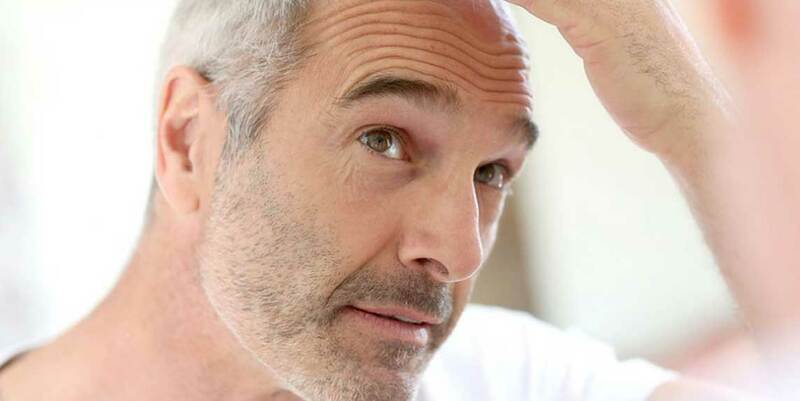 Depending on the age when these conditions are diagnosed, both young and old men can see increased hair loss. Male pattern baldness is considered to be a genetic trait; your parents can pass it on to you. Unfortunately, there is no gene therapy to prevent male pattern baldness. Other genetic conditions, including a predisposition to thyroid disease, cancer, and other conditions can all cause genetic hair loss as well. Of course, genes affect us our whole lives, so the age at which men start losing hair can be different based on the severity of their genetic conditions. Do you live in a highly populated, potentially polluted area? Recent studies find that pollution and air quality may be linked to hair loss in metropolitan areas. Because of the carcinogens and toxins in the air latch on to our hair and skin cells, it’s easy to see how that might affect the health of our hair! Other environmental conditions causing male hair loss may include secondhand smoke, extensive chlorine exposure, sun damage and arid/dry locations. All of these can make hair more brittle and easier to lose no matter your age. There is such a thing as washing your hair too much – or too little. The quality of the products you use and even how hot your showers are can affect male hair loss, too. Styling your hair too much or itching your scalp a lot can also cause hair to fall out. There are a number of ways to help keep your hair healthy, and it starts with attention to your personal hygiene routine. This will also help you support your hair as you age and as hair loss becomes more likely. Yes, as men age, they lose hair. However, you don’t have to be old to lose hair, as many young men can attest. To ensure that you keep your hair for as long as possible, take the above factors into account. If you have genetic or medical conditions affecting your hair, talk to your doctor and eat a balanced diet. Pay attention to personal hygiene, as well. If you keep your hair healthy, it will stick around longer!